Street artist Federico Frum’s art has taken him many places. After being adopted from an orphanage in Bogotá, Colombia at one year old, his family moved to the Washington DC area where he studied art at George Mason University. As a young college graduate, Federico (known as “Rico”) moved to New York and explored the art scene, honing his street art skills and doing graphic and apparel design for clients such as National Geographic, The History Channel and Nike. He grew tired of New York and left for a six-month journey through South America that completely changed the direction of his life. I first met Rico at a fundraiser for Dreaming Out Loud, a DC-based non-profit organization that focuses on combating food deserts (areas with limited access to affordable, fresh foods), providing safe spaces for youth, and strengthening communities. Rico was live painting at the event and I was impressed by his use of clean lines and distinct graffiti edge. After checking out his website, I learned that Rico is currently developing his own charitable organization, Mas Paz, to raise funds for the Colombian orphanage where he spent time as a child. I was dying to know more, so a week later I met Rico at a Washington DC cafe where he openly talked about his past, present and future as a street artist. Mas Paz is a new foundation offering support to Colombian orphans. How did Mas Paz turn into an organization? Ever since I became an artist I have wanted to give back. I’m adopted from Colombia; I came from La Casa de la Madre y el Nino in Bogotá and if I were not adopted I might be in the streets. Kids huff glue in the street, so I feel like I’m lucky to be alive. I feel like if I can walk and talk right now and I can eat lunch and dinner, [then I can start] trying to help out. So Mas Paz is a platform for me to [support the cause]. If you see a Mas Paz sticker, you’ll be able to go to my website and see that there’s a little bit more behind the art and imagery. So how long have you worked with Sue Bell, the founder of Homeward Trails, to develop your charity? I’ve known Sue for a while. She is a go-getter. She used to work with homeless people in DC and has done all these outreach programs. When I got back from my South America trip we started talking and she was like, I’m really interested in what you’re trying to do. We’ve been having meetings, trying to get the LLC, trying to get trademarked and then starting to raise money. We’re planning a trip to Colombia and Africa within a few months so we can start assessing who really needs the funds. Does the orphanage know what you’re doing? They know what I’m doing. They’re kind of hesitant, it’s funny. So I’m just taking that one step at a time. Hesitant about what? The charity angle? More about where they really need the money to go. So we’re still kind of building and thinking about where the money is going to go [and] if it will go to that exact orphanage. We’re trying to figure out where the money is needed the most. In my orphanage, kids are taken care of, but when it comes to meal time, they’re still hungry. If food falls on the floor they will eat that too. I’ve been back to my orphanage and volunteered there a couple times; I painted a mural there two years ago. All the money I’m making right now is going towards promoting the project. If the orphanage you lived in doesn’t need the donation, do they have a sister orphanage that has a greater need? Yes, there are so many projects in Colombia that need help. We’re looking forward to going down to Colombia to make an assessment. [My colleague] Sue was also in Africa and she started a program in Kenya so she wants to do a joint Colombia-Africa project. It sounds like it might be too big on our shoulders but you gotta dream, man. 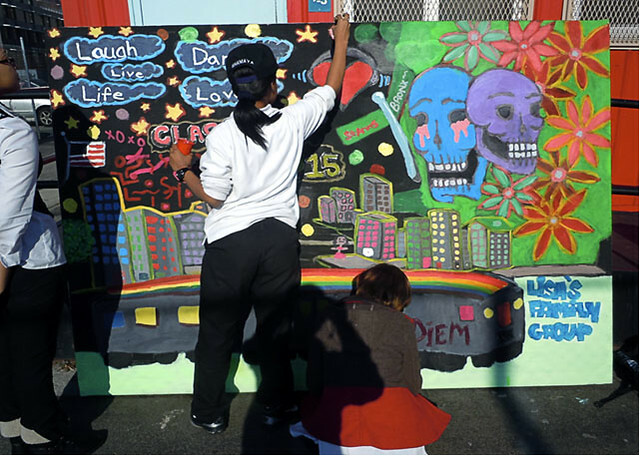 Students painting a street mural in the South Bronx. You have also worked on community projects in the United States. So where and when was your mural workshop? That was at South Bronx High in New York City’s South Bronx, in 2011. 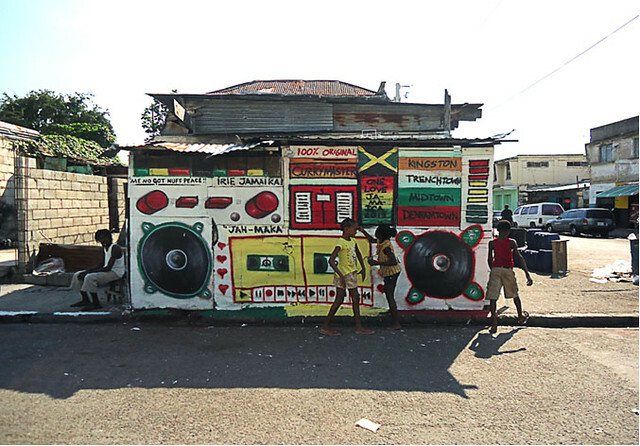 A boombox mural in Jamaica painted by street artists Makatron and Federico Frum. Do you have plans for a mural workshop in the DC area? Totally. I might be doing a summer program with mural workshops in DC at Next Step Public Charter school. When my friend Makatron and I were in Jamaica, he started this organization called Ghetto Blaster Projects to paint boomboxes in low income areas. I was in Jamaica for a wedding and he came and met me afterwards. He’s a dope artist from Australia doing a lot of cool stuff and he was like yo, let’s paint. So we got this dude to show us around and he was like you can paint there, you should go there tomorrow. So we get up the next day, we buy our paint, and we drove up to the wall of this shack and started painting these boomboxes. All these little kids came out to watch so we were like, here take this brush, paint that black. Take this brush, paint that yellow. It was really dope. This one was in the middle of Trenchtown, in the hood. Like the hood hood. We got there and we started painting, and all these kids come out and they’re all painting with us. And then this one hamburger lady is like, do you think you can paint a hamburger on my building for me? And we’re like yeah, no doubt! Let me help out the community. Let me help you gain revenue for your hamburger shop, let me hook it up. So I painted the hamburger for her and all these people came out and were like, can you paint my storefront? Can you paint my ice cream parlor? We gave the kids paint and they were painting the sidewalks and going across the street and painting the walls. They may never have painted before in their lives! 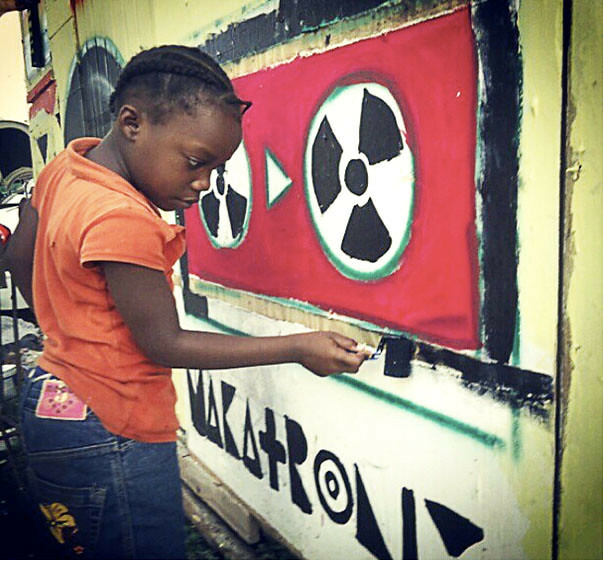 A girl helps paint a boombox street mural in Trenchtown, Jamaica. How does being back in DC affect your work compared to your time in New York? In DC, I can breathe now. I can sit down and just relax. And I don’t feel all pressured about my art, I can live my life and I can paint. I feel like I’m on a much more focused hustle being here now. In New York you’re all scatterbrained trying to do a million things; now it’s just like, it’s all good, I’ll get there. And I mean, a lot of my dope art friends are not from New York so it’s not like you gotta be from New York to make it. 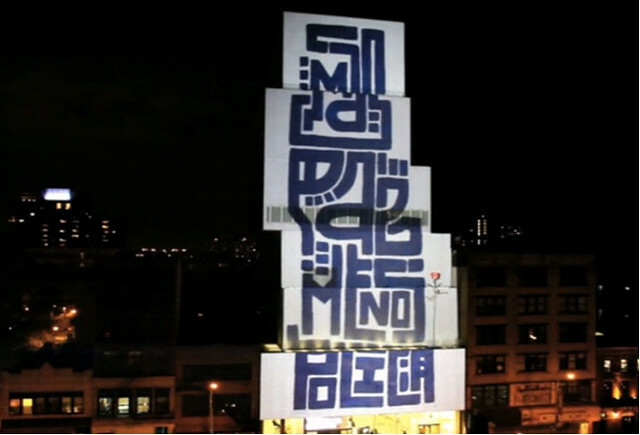 In New York you have done projections, as well as murals. How did those come to happen? Do you have to have a permit for something like that? Nope. We kept it lit for like an hour or something and just got a lot of good feedback. The piece was for this project called “Let Us Make Cake” in 2011. It was a big projection/installation where all of the artists made their art to fit the shape of the New Museum. This was a piece that I did called “More Peace, Less Police,” it was about a lot of the police brutality going on in New York. Translated in Spanish it says “Mas Paz, Menos Policia”. It was up all night. “Mas Paz, Menos Policia” projection in New York City. You were at Art Basel this past year? Yeah, this was commissioned in Miami. I was given a space in this huge outdoor gallery during Art Basel. 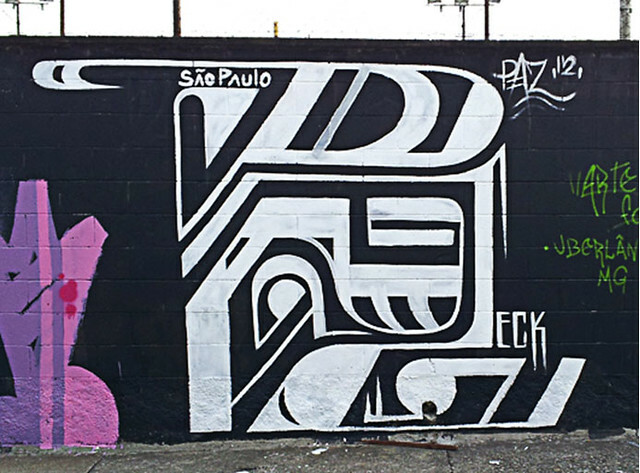 I painted alongside Reka, Faith 47, MakaTron and my friend Evoka, who gave me the wall to paint. When you left New York for South America, was that more of a homecoming or did you go there specifically to do pieces all over the continent? It was everything, it was like a getaway from New York. I landed in Brazil and chilled in Rio for almost three months. Then I want to Argentina, Uruguay, Bolivia, Peru and Colombia. How has that trip affected your work now? 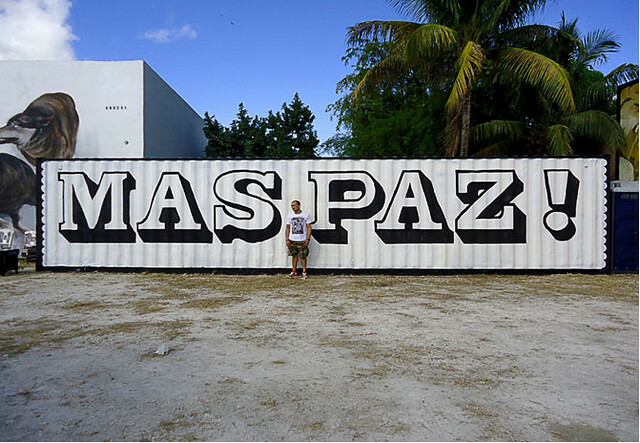 I write paz, meaning ‘peace’ in Spanish, and people in America really don’t what that means. So it was cool to be in South America where many people speak Spanish and [understood] the idea. Also, in South America there’s a lot of art. Street art is crazy in Brazil, it’s everywhere and there are many different styles. In South America, everybody is so inviting about painting together. In America it’s more about ‘me’– “I’m going to paint here, I’m not going to paint with you.” [Working in South America] helped me embrace my artistic style and feel comfortable. I figured out what I was trying to do: spread a message instead of it being just about me. Street mural in Sao Paulo, Brazil. What’s the best compliment you’ve received from someone who has come across your work? I think it’s just people that are really happy that someone’s spreading a positive message of peace. Like in Colombia, there’s been a lot of war, a lot of people are displaced from their homes and a lot of people have died. So when people see someone in the street writing “peace” they really like it. When I was painting a mural in Colombia two years ago, a woman came up to me and gave me 1,000 pesos which is like giving someone a dollar. People in Colombia don’t have a lot of money, especially in the area where I was painting, so for them to offer me money that’s a huge compliment. 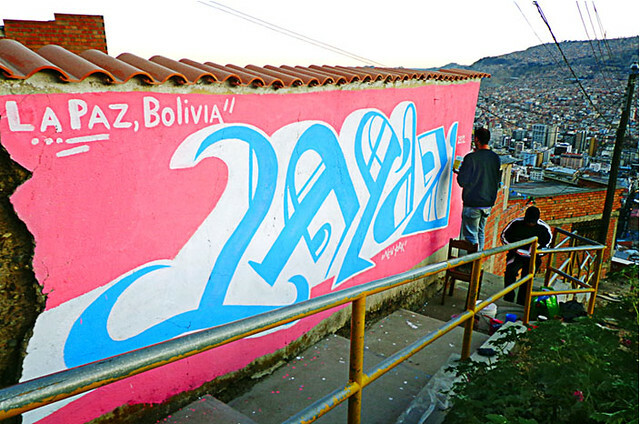 Street art in La Paz, Bolivia. The legality of street art is questionable. Your pieces that are in the street, did you have to do those at night? Most of the walls that I paint now are legal spots. There are walls in Colombia and all South America you can just go up to and paint [with permission]. Like any neighborhood, you need to be careful, but no one really cares. I was given $50 one time I painted someone’s house in Brooklyn, because they liked the message and they were really cool. All of this is just for fun… nothing really illegal that had to be done at night. So what do you think is the difference between work that some would consider as ‘just tagging’ versus the work that artists like you and Shepard Fairy and Banksy produce? I think everywhere you look around, you see art. Like this is graphic design (he points to a Barnes & Noble poster), this poster, some graphic designer made that, so that’s art. You know? So like some little kid that’s catching some ugly tag on a train, it’s still art. He’s trying to do what he’s trying to do. So I can’t say which is better, I guess it’s just dedication. If you’re really into something, how dedicated are you to it? So I think there are some people that are really dedicated, they put thought into it [and so] you feel something from it. You feel like this person really has emotions to the art which I think is the most important thing. If you’re going to do anything, do it with your heart. La Casa mural in Bogota, Colombia. Do you think artists like Banksy and Shepard Fairy have taken away from the credibility of street art and graffiti or do you think that going mainstream is something that’s good for the street art community? I think their art is amazing. The stuff that they do, what they’re putting out is quality work. And they both come from a street art level. I mean, I don’t know how rich they are but they definitely got their ups in the street. They definitely did a lot of illegal stuff before they became famous, so I think they deserve what they’ve done. If anything, I think it’s good that they made street art so interesting. Not like a sell out or anything? No, not like a sell out. You’ve definitely got two elements to it, it’s like keeping it real element and then the fake element. There are some people out there that you meet that are like “ohhh I like street art!” and you’re like that’s dope, I’m happy you like street art but…how did you learn about street art? Did you go and do it on your own and no one taught you? Or did you look on the web and find out how to make a stencil and how to make wheat paste, how to spray paint, how to buy fat caps. If you just used google, then it’s kind of lame. Who or what inspires you the most now with the projects you’re working on currently? My friends: Makatron, Meggs and the Everfresh crew, Bruno Smoky , Youth Waste and Monolith inspire the sh*t out of me. Keep up to date with Rico’s latest street art projects by following him on Twitter (@pazito_pazito) and Instagram (MasPaz). More images of his artwork are available on the Mas Paz website. 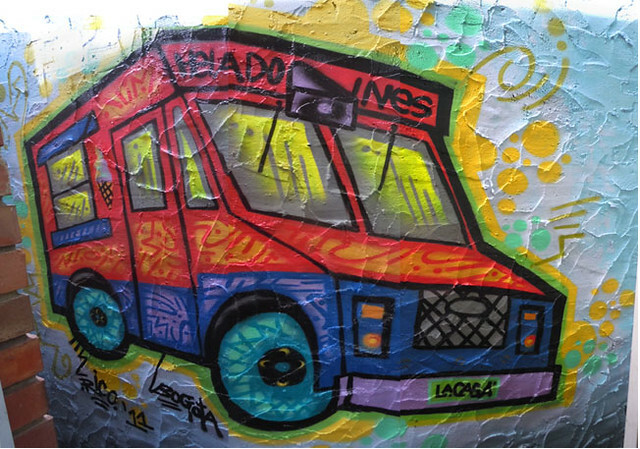 If you’ll be in DC next month, Rico is bringing his Mas Paz movement to the Corcoran College of Art + Design for Ill Street Blues, an exhibition celebrating street art and graffiti from March 27 – April 14. 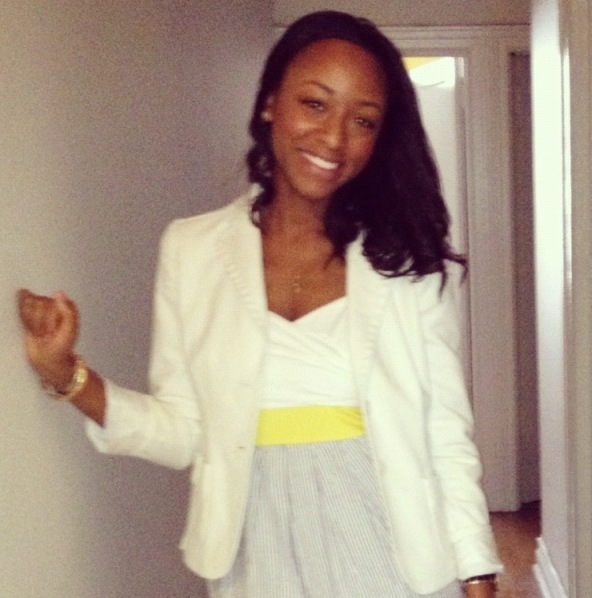 Shayla Martin is a freelance food and travel writer specializing in destinations, hotels, and resorts. She is the founder and editor of YourLandMyLand, a travel and lifestyle blog dedicated to exploring the people, cultures and landscapes that make up the United States of America. Follow Shayla on Twitter @Yourlandmyland and on Facebook. Rico is awesome..i know him personally and in proud to say that! Can’t wait to meet him in person– Shayla’s interview really brought him to life 🙂 What a great cause.